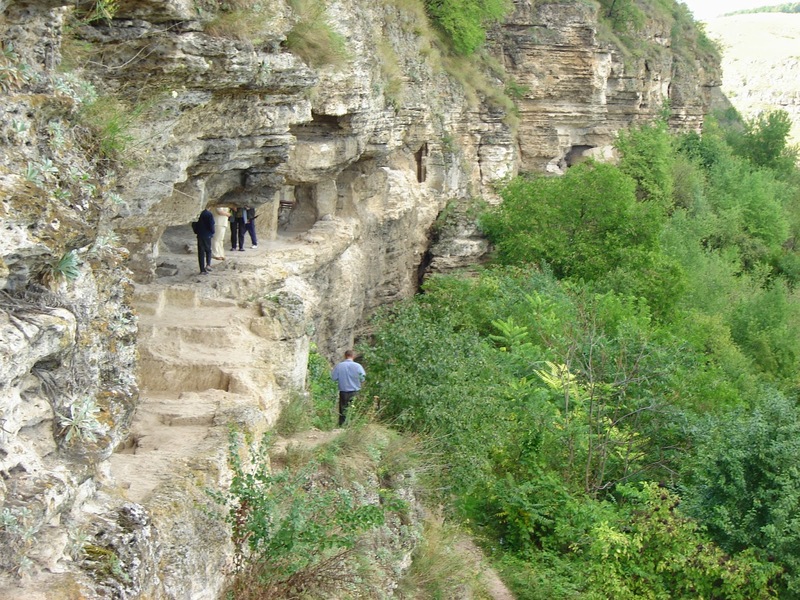 On August 23, 2014, the Chisinau Branch had an activity at Tipova, Moldova where the historic Tipova Monastery is located on the bluff overlooking the Nistru River and Transnistru territory on the other side. This is the modern Orthodox church on the top of the bluff. This is the sign showing all of the places to visit at the historic site. The Orthodox church and the many visitors looking around the pleasant courtyard. In front of the church is a very pretty rose garden with statues and monuments. Sister Kneib (Arlana) enjoys the pretty roses. A pink and yellow rose in with some marigolds. A monument in the church courtyard. Elder Hammer visits with some of the investigators that came on the trip from Chisinau. Other members of the trip enjoying the view atop the bluff over looking the Nistru River. In the background is Sister Uhl. Elders Hammer, Daland, Newburn, and ? get ready for the hike. Looking upstream of the Nistru River. Looking across the Nistru River at the village of Zazuleni in Transnistru. Looking downstream of the Nistru River. Sister Kneib and Elder Kneib getting ready to hike the trail down the river bluff. Elder Kneib is heading down the trail. Elder Kneib is caught in the act of taking pictures of one of many indentations of the limestone bluff. Below, Elder and Sister Kneib take a break in the shade of a limestone overhang. A couple of hundred years ago, monks carved caves into the limestone and created a hidden monastery in the river bank. This shows more of the numerous rooms in the side of the river bank limestone. This shows more of the trail to the ancient monastery in the side of the river bank. 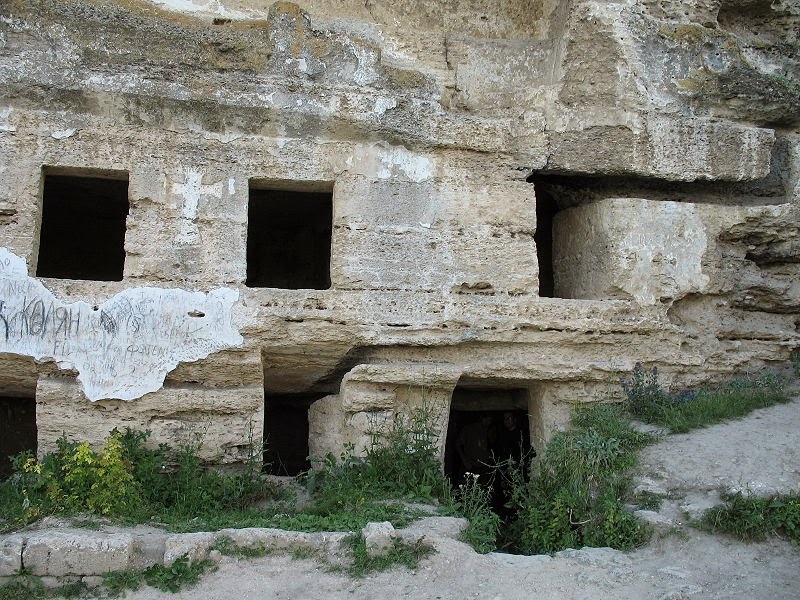 This shows some modern renovations to the ancient cave living quarters of the monastery. Where the crosses are located are the burial sites of some dead. This shows inside one of the rock rooms in the river bank. Sister Kneib investigating a cranny in the rock room. This is the plaque saying that this is a medieval monastery that was used between the 15th and 19th centuries. Sister Kneib is making way back up the trail to the top of the bluff. This a typical monument that is common along the roads throughout Moldova. Sister Uhl and Sister Bray rest after their trip to see the old monastery down the river bluff. Elder and Sister Flanders resting after completing their first week in Moldova. A horse-drawn cart coming up the road near Tipova. After the hike, a picnic is prepared for everybody that came on the trip from Chisinau. Along with the fresh fruits and vegetables, sausages are roasted over the open fire pit. Elder Lex in the striped shirt is helping. Elder Lex comes from a town in southeastern Austria. Also turning sausages are Saugus Buniatyan and Victor Ceban.